In the government-contracting community, one executive move can have a chain-reaction effect. While every year sees executive moves throughout the govcon community, this past year has demonstrated just how each move influences other executives. 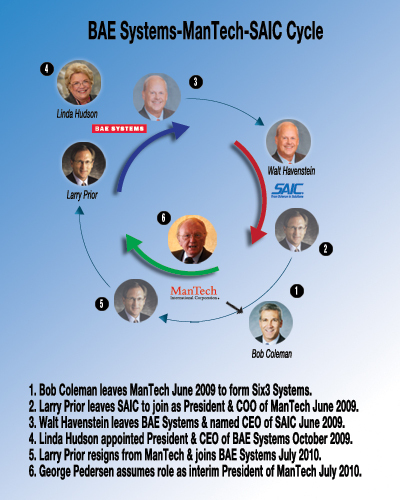 Back in June last year, Bob Coleman stepped down as the president and chief operating officer of ManTech International. The entrepreneurial Coleman then formed Six3 Systems, a company focused on acquiring government-service providers focused on national security. The opening at ManTech was subsequently filled by Larry Prior, a hard-charging, aggressive executive, who left his position as chief operating officer at SAIC. In September, Walt Havenstein, known in the industry for his coolness-under-fire, left his post at BAE Systems and moved to SAIC, where he took up the position of chief executive officer. Subsequently, in October last year, the firm but personable Linda Hudson was appointed president and CEO of BAE Systems, Inc., the position formerly held by Havenstein. Last night, Larry Prior announced his resignation as president and COO of ManTech. Today, BAE announced Prior will be joining the firm as executive vice president reporting to Hudson. As a result of Prior’s departure, legendary Chairman and CEO George Pedersen will also assume the responsibilities of president of ManTech. The music stopped and everyone has a chair, for now. Stay tuned to GovCon Exec for upcoming moves in government contracting.